Begin your Sunday with a hearty brunch! If you're not sure where to dine, here's a list of restaurants we recommend! Arwana is home to the perfect Sunday with your loved ones – featuring Beach & BBQ Brunch. Succulent barbecue and carving stations, freshly shucked oysters and local specialties are amongst the favorites. Make your own cocktail and try out a liquid nitrogen ice cream. Enjoy our complimentary beach and lagoon pools access. Every Sunday from 12pm-4pm at only Rp 250,000++/pax! Weekly Mojito Specials and a salsa pool party! Every Sunday from 2pm, Mojitos at only Rp 60,000++! Delight your inner circle with a sumptuous brunch at the chic ambience of Boneka. Known for its refined taste and flavor, guests can experience the three brunch concept all at the same time: buffet, a la carte, and endless pass arounds. Your brunch will be complemented by a live jazz performance by the resort’s resident talents. The Beverage Package is an additional package to complement The Brunch Package, inclusive of sparkling wine. Enjoy Buy-2-Get-3 on the Fire Brunch, every Sunday from 12 pm – 3.30pm, priced at Rp. 585.000++. Simply use promo code CESUNFIRE every time you make a reservation via the Chope app or website. - Valid only on the FOOD PACKAGE available for FIRE brunch. - Not valid on FOOD AND BEVERAGE PACKAGE or FOOD AND CHAMPAGNE PACKAGE. It is a whole new experience at the all-new Sunday Brunch at Fire. The brunch features more diverse treasure from western specialties, live counters, seafood bar to a premium selection of alcoholic to non-alcoholic beverages, accompanied by live acoustic. Priced at Rp 585,000++ for Food Package inclusive of free flow of soft drinks, juice and a glass of bubbles as a welcome drink. Priced at Rp 1,235,000++ for Food and Beverage Package inclusive of free flow of bubbles, wines, beer, selected cocktails, soft drinks, and juices. Priced at Rp 1,985,000++ Food and Champagne Package inclusive of free flow of champagne, wines, beer, selected cocktails, soft drinks, and juices. Enjoy Buy-3-Get-4 Feast Market Brunch, every Sunday from 12 PM to 3 PM, priced at IDR 410,000++ per person. Simply use promo code CEFESUN every time you make a reservation via the Chope app or website. - The promotion cannot be combined with any other promotions or discounts. - Valid only for the basic package with food and non-alcoholic beverages. - Not valid for alcoholic beverage packages. 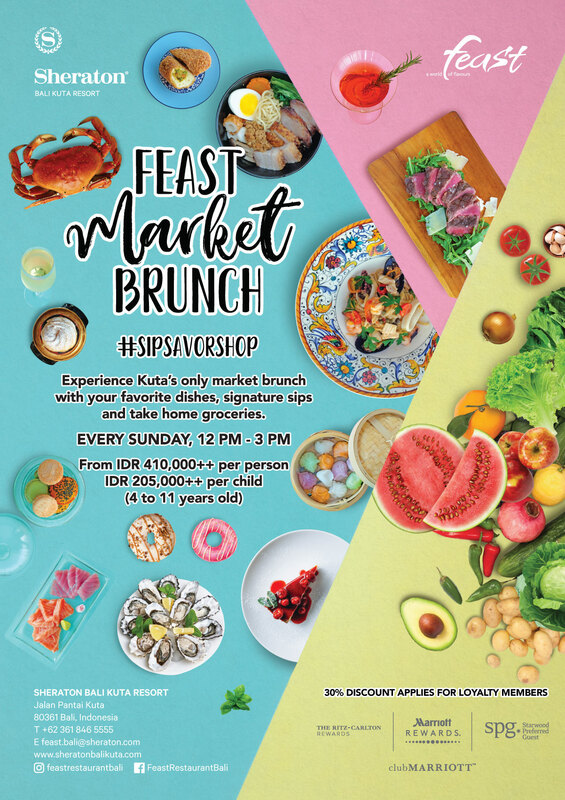 Experience Kuta's only market brunch with your favourite dishes, signature sips and take home groceries for only IDR 410,000++/paxand IDR 205,000++/children (4 to 11 years old). Sit back in our alfresco area while enjoying the bustling street views Kuta with a Buy One Get Two Deals on signature cocktails and selected beer and wine. Select your favorite burger with fries or wedges for the price of Rp 99,000++ per set. Sundays are meant for a leisurely pursuit. Tantalize your palate with the island’s most lavish Sunday Brunch. By the ocean and with an all you can eat a la carte concept in mind, indulge in premier selection of fresh catches of the day including caviar, prime meat selection, decadent desserts and many more. Each dish is prepared a la minute to control its taste and quality. Start your unparalleled brunch experience with champagne and canapés at 11am in Kayuputi Bar before brunch begins at 12pm. The Brunch Package includes a one-hour complimentary aperitif, champagne and juice selection at Kayuputi Champagne Bar from 11am to 12pm, followed by brunch between 12pm until 3pm. The Beverage Package is an additional package to complement The Brunch Package and includes free flow champagne, a selection of premium red and white wines and cocktails from 12pm till 3pm. This package also includes a variety of digestives and cigars, served from 2pm to 3pm at the Kayuputi Champagne Bar. Enjoy Sunday brunch with the feel of the breeze, the sound of the waves, and a fresh taste of the sea. Available at IDR 485,000++/pax.